Our firm is dedicated to providing you with quality estate planning resources so you can become familiar with all of the existing options. 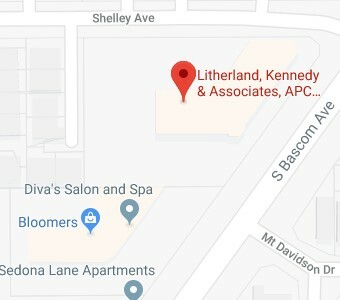 When you visit or call Litherland, Kennedy & Associates, APC, Attorneys at Law, we want you to feel comfortable discussing such an important issue concerning both you and your family. We want to arm you with the information you need to make an informed decision about your family’s future. That is why our firm offers this wealth of free information and free seminars. Read our Estate Planning articles, and if you’re in the area, join us at an Estate Planning seminar. We want you to feel confident about the choices you make—let us be your guide on the path toward preserving your family’s future. We provide comprehensive, tailored estate planning services to meet all of our clients’ needs. Below is a sampling of the type of services we offer. If you have questions about any of our services, please do not hesitate to contact us or call us at (408) 356-9200 or (831) 476-2400. We offer guidance and assistance to members of the LGBT Community on their unique estate planning needs. This includes assistance in setting up Living Trusts and Health Care Directives. Our law firm helps clients create a plan to handle their affairs in the event of an incapacity before they pass away. This includes planning to avoid a Living Probate or Conservatorship proceeding. We help clients qualify for government Medi-Cal benefits legally and ensure their estates are preserved for their families, instead of their nest egg being wiped out by high nursing home expenses.